The launcher Energia M was elaborated for putting into orbit payloads from 4 to 35 t for low, average, high, circular and elliptic orbits (6.5 t for a geostationary orbit), as well as routes towards the Moon or the planets of the solar system. The rocket is constituted by the systems and the vehicles of the Zenit and Energia. Energia - M includes a central block (oxygen and hydrogen tanks) created from the central block of Energia and two blocks of the 1st stage taken from Energia too. The fuel used for Energia - M is based on hydrogenated petroleum, but afterwards it was planned to use a mixture of oxygen and hydrogen. The decisions of constructions and developments of Energia - M once accepted, allowed it to be used together with Energia and its ground installations. replacing the Proton launcher, highly toxic, by using another fuel and limiting the ecological damages due to the fall of the rocket in case of damage. get rid of the alienation region in the mountains zones of the Altay. increase the mass and the size of the spatial vehicles from 1.5 to 2 times to satisfy the growth of the spatial needs. insure the takeoff of heavy spatial vehicle for helio-stationary orbits. insure the use and the conservation of Energia and Bourane ground technological sets. 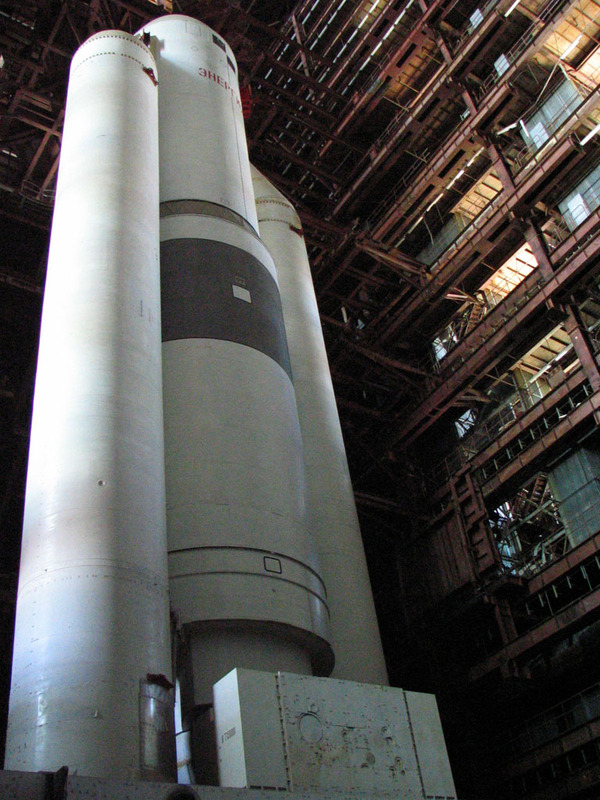 Energia - M surpass the foreign commercial launchers such as Titan - 4 (USA), Ariane - 5 (France), HII (Japan), on the energy plan as well as on the characteristics of exploitations. By using an ecological fuel Energia - M can easily compete with the other foreigner systems of orbiting by a cheap exploitation cost. As possible improvements of the launcher it was planned to set up a return system of the 1rst stage blocks (see Energia's boosters), to get totally rid of landings zones in the region of the boosters's fall. To validate the ground installations a full scale mock-up was built and brought on the launch pad (in December 25-27th, 1991). The central block of Energia - M includes fuel tanks (Oxygen and Hydrogen), engines, control systems, telemetry and elements of the pneumo-hydraulic system. The motor unit is made of a RD-0120 engine (РД-0120) in the Ц bloc, of the nozzle's orientation system, elements of connection with the Я block. Although a maximum of elements are taken from the Energia's Ц block the quantity of armature and the number of elements of the pneumo-hydraulic system are lower. The diameter of the B block is 7.7 m, the height of 25.5 m (50.5 m with the nose cone), the mass of the block is 20-25 t. The B block's tank are cylindrical with a spherical bottom of a radius of 4.185 m, what allows to use equipments for the manufacture of the reservoir of the Energia's Ц block ( but they have some differences in comparison to these last ones). The volume of the fuel tank is 600 m³ (the volume of the Ц block is of 1400m³) and its height is 12 m. The oxygen tank distinguishes itself from the Energia one by a height twice as small, the volume is 200 m³ (the one of Energia is 600 m³) and its height is 6.2 m.
The structure of the section of the B block is simplified because of the absence of concentrated loads and the reduction of the constraints, the connections between the B block and the launch pad, the fixations of the block, the central girders and the strengthening pieces are simplified or suppressed.